This story is presented as part of a series of true narratives collected for TMI Project’s Black Stories Matter initiative. Out of 232 four year public schools studied over 10 years, 53 percent saw gaps between black and white students either stay the same or increase, resulting in a growing gap between the numbers of black and white students who graduate. ​Moreover, nearly one-third of the colleges and universities that improved graduation rates overall actually saw graduation rates for black students remain flat or decline. In the of fall 1994 I took the E train from a rundown basement apartment in Jamaica, Queens to attend my first day at New York University. At 19, I graduated from SUNY Delhi with an associates degree, a 3.8 average and multiple scholarships. Since I grew up in the projects in Brooklyn, SUNY Delhi legitimately felt like it was in the middle of nowhere BUT the student body was 15% black and primarily from inner cities. The entire student body hovered somewhere around 3,000. Black students found each other easily and formed a community that frankly felt identical to the one I’d left. We even mostly all lived in a dorm affectionately nicknamed “the projects.” So, yeah, there were some issues even within a culturally diverse student body. But ironically, 170 miles from home, in what often felt like a town where people were outnumbered by cows I experienced almost NO culture shock. A life spent in NYC’s public education system had prepared me for an environment where the faculty and staff were 99% white. I joined the black student union. We went to “black” events on other campuses. We sat together in the dining hall. Going to college and living on campus at Delhi for two years was great, but I wanted to come home to the city I was determined to conquer. SO, when I was accepted as a transfer student to NYU, I was excited, even though that meant living at home again. Or so I thought. That summer I arrived back home, my single mother and I were evicted from our one bedroom apartment in the projects. My mother sat me down in our living room and announced that she and her boyfriend had tried to find a two bedroom apartment so I could continue living with her, but they couldn’t. So together, they were moving into a one bedroom apartment in Far Rockaway, Queens (emphasis on the word FAR). Here were my options: Sleep on the couch and commute two hours a day each way into the city for classes or figure something else out. I became an adult that day. The summer that I should have been preparing for two years of rigor at one of the best colleges in the country, I was scrambling to figure out where I was going to live. I remember walking into my first political science class, under an inordinate amount of stress, unusual for an NYU college student. When I arrived, I stood frozen in the doorway looking at a sea of 125 white faces. The average class size at Delhi was 30. NYU tried to support me via the HEOP program but it was almost like trying to connect through a distortion field. Everyone was white. Everything outside of the HEOP office was structurally set up to support a specific kind of student that came from a specific background – white, middle to upper class, steeped in “American” culture (i.e. white). All of my professors were white, all of the administrators, counselors, etc. and I had not fully honed my code switching skills yet. Occasionally, I still presented as, “standing at the bus stop sucking on a lollipop”. “Don’t get it twisted, imma blow this midterm up”, in response to my professor’s concern that I might be juggling too much. He looked at me like I had two heads. NYU’s black student population was 4%. Four percent of 50,000 students. I knew there were other black people… somewhere. But I had NO idea where to find them. Nothing in the NYU culture was for me. What the hell was a “Spring Break”? For my peers, a ruckus trip to party in Cancun. For me, an opportunity to work overtime. Networking? Not much of that to be done at my job at Burlington Coat Factory. I felt too ashamed to explain what I was going through to what felt like a composite of well meaning but completely foreign white people. In my family, you didn’t “spread your business” with people you didn’t trust. And for the most part, you didn’t trust white people. It would have been easy to blame my mother entirely for putting me in this situation but the reality is that our lives and the lives of all people of color are shaped by the class and race construct by which we live. A few years before I started college, my mom, tired of being passed over for promotions for a decade in favor or white people with less experience, sued Brookdale hospital for discrimination. It was settled out of court when it became clear that she would win, but the settlement was barely sufficient and my mom had to agree to leave her job in order to accept it. What if my mother had been given those promotions and we’d moved up from working poor to middle class? Maybe she would have made different choices. Maybe she would have bought a house. Maybe I would have started college with a place to live. Two years became 2.5 years. Then three. Then 3.5. I dropped out then re-registered. Then dropped out and re-registered again. I had to transfer to the continuing education division to work full-time so I could escape the basement apartment in Queens where unbeknownst to me, people were breaking into my apartment and stealing my belongings. Most importantly, I had a pervasive feeling that I just didn’t belong. Graduation seemed more like some amorphous and unrealistic brass ring. I felt like the other students were in on something that I just couldn’t and would never understand and I was growing depressed. As a community, we cannot ignore the impact that race has on the probability of success in higher education or the fact that our higher education system, along with all of our bedrock systems, set up a biased foundation. Our stories are unique and our struggle is real. We need to start talking about how to create cultural environments that allows students of color to thrive. And in order to do that, we have to hear the stories of the lives that are impacted to foster understanding across the chasm. 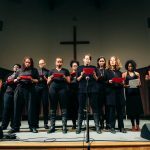 To that end, TMI Project is bringing Black Stories Matter to Bard College! 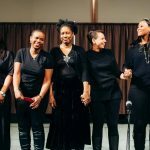 On April 4th, we present inspiring true stories and monologues about Black people surviving and thriving in the Hudson Valley– both for the school community and for the general public. Performances will be followed by a panel discussion, which will allow the audience to tackle hard questions around race, identity and community. 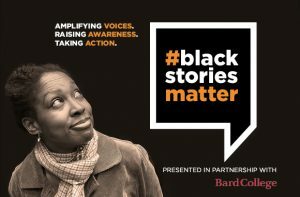 Black Stories Matter @ Bard College is open to the public ($20), and all local college students are encouraged to attend for FREE.